Adam and Cat­her­ine at Geysir. 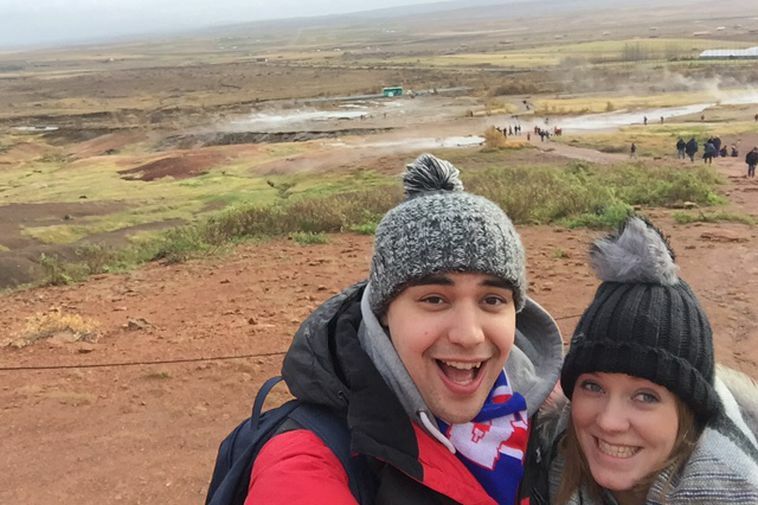 Adam Williams, the young British police officer who fell victim to a vicious knife attack while supporting Iceland at Euro 2016 in France, proposed to his girlfriend while in Iceland on an all-expenses-paid trip funded by Icelandic well-wishers. The couple got engaged on Tuesday, Williams’ plan being to always come back to Iceland to celebrate the engagement. Their trip – paid for by kind Iceland fans moved by the story of Williams’ brutal stabbing in Paris – is going well. “Catherine and I are having a wonderful time in Iceland. People are very hospitable and kind to us,” says Williams. The couple will be taking coffee with the President before moving on to see Iceland play Finland this evening at Laugardalsvöllur stadium in Reykjavik. The couple will also be watching the Turkey game on Sunday.